Apprenticeship Awards Cymru 2018 – Wrexham aerospace company flying high after national award. | News by Wales Express News, People Before Profit! Apprenticeship Awards Cymru 2018 – Wrexham aerospace company flying high after national award. 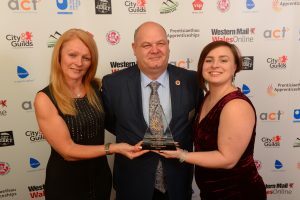 A Wrexham aerospace company, which works closely with a learning provider to develop specialist Apprenticeship courses, has been named Wales’ Large Employer of the Year. Magellan Aerospace collected the accolade at the prestigious Apprenticeship Awards Cymru held at the Celtic Manor Resort, Newport on November 9. Magellan Aerospace’s senior training and development officer Dave Evans and Laura Higgins, Magellan Global recruitment co-ordinator, receive the award from Karen Buffey, regional manager for Babcock International Group, sponsor. Dave Evans, the company’s senior training and development officer, said: “We are absolutely ecstatic. It has been a long time coming to get recognition for our Apprenticeship Programme. “The award shows that we have a programme that can compete with anybody else in the sector and demonstrates to staff that Apprenticeships do bring worth to the business. Magellan Aerospace has invested heavily in Apprenticeships and developed a dynamic workforce capable of remaining at the forefront of a competitive global industry. “We have worked closely with Coleg Cambria to make sure our programmes fit in with the needs of our business,” said Mr Evans. “We are also part of the college’s engineering employer network where we can share best practice and discuss common issues. The company has more than 400 employees who design, engineer and manufacture aero-engine and aero-structure assemblies and components for aerospace markets, advanced products for military and space markets, industrial power generation and specialist products. Apprentices are encouraged to become an integral part of the community by getting involved in fundraising for the college charity, as well as promoting the benefits of Apprenticeships to other local businesses and schools. Engineering Manufacture and Business Administration training programmes have evolved over the past 20 years and Magellan Aerospace currently has 74 apprentices on its books, drawing warm praise from the company’s training partner. “Magellan Aerospace is a model company when it comes to apprentices,” said Vicky Barwis, director of work-based learning at Coleg Cambria. “It is a real partnership approach to the programme, with Magellan starting early to talk to full time students to ensure they are recruiting the best local raw talent for their business. Minister for Welsh Language and Lifelong Learning, Eluned Morgan congratulated Magellan Aerospace together with the other award winners and finalists for setting the gold standard for Apprenticeships and Traineeships. She praised the company for going the extra mile to support apprentices and for its commitment to the Apprenticeships Programme in Wales. Previous articleOver 57,000 pheasants have been released onto a Welsh university’s grounds to be shot.